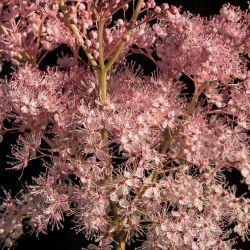 Meadowsweet is one of those unique flavors which you’re unlikely to encounter much outside of gin. Owing its distinctive aroma primarily to coumarin, the essential oil which has a sweet, hay and vanilla aroma. Its popularity in gin is perhaps owed to Hendrick’s which had originally included Meadowsweet as one of its botanicals. The plant itself is a 3-6 foot tall plant with feathery flowers at the top of reddish-purple stems. The plant is in the same family as common roses and is also known as Queen of the Meadow, because its tall white flowers appear like crowns, towering above the grasses below.